After my recent visit to México City I am left with a myriad of impressions from all the different events. I'll get to blogging about them but sitting here wondering where to start there is one thing that keeps elbowing itself to the forefront of my mind. Joy. The joy of cycling. 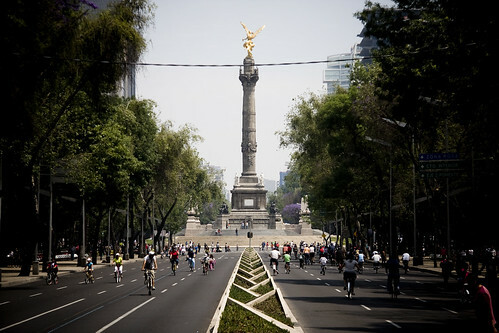 Each Sunday, the massive Reforma boulevard in the heart of the city is closed off to cars until 14:00. 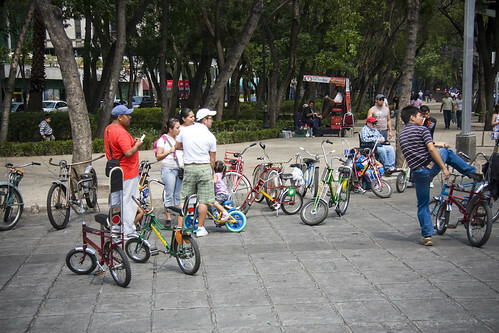 The citizens of the city take to Reforma to... go for a bike ride. 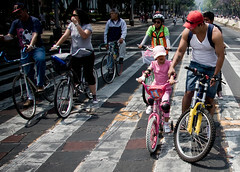 I've been on bike rides in many cities over the past couple of years but for some reason the experience in Mexico City last week was simplified and yet poignant. When riding in the very inspiring Critical Mass in Budapest you are actutely aware that there is a purpose overshadowing the simple art of going for a bike ride. There is politics and societal change on a big ol' soapbox. 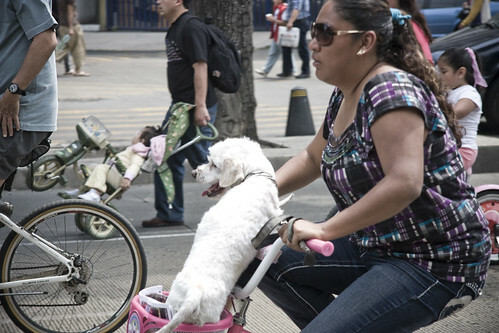 Which is great, sure, but in Mexico City it was just... a bike ride. Thousands of people enjoying the simple joy of cycling. Not out to prove anything, not intent on being seen and keen to show off their 'gear' or what have you. 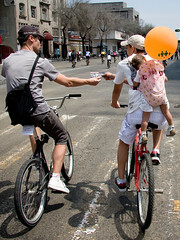 Just families, friends, couples riding up and down the boulevard. I can't actually remember experiencing this sensation before on my copenhagenize travels. Perhaps the bike ride in La Rochelle, France comes close, but it is still far off the mark. This smile from one of four young friends on funky bicycles says it all. Summed up right there. The number of families, large and small, was amazing. So many kids, too. 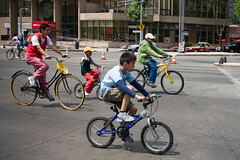 Reforma has a the smoothest, newest asphalt surface so it was wonderful to ride on. 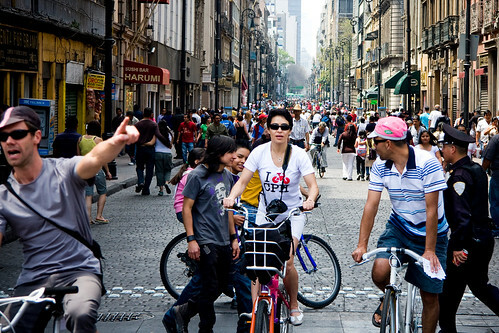 The idea stems from Bogotá, where these closed off streets have been happening for a few years. 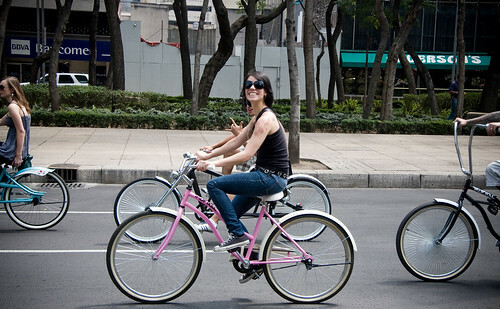 It's a brilliant idea and a great step on the way to reestablishing the bicycle on the urban landscape. 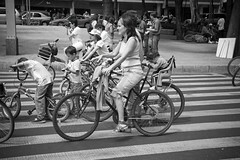 I have heard, however, that the police in Bogotá are now confiscating bicycles from people who don't wear a helmet. [No reports of car confiscations for automotive traffic violations]. So thanks, Bogotá, for the previous inspiration. Hope you enjoyed your stay in the urban cycling spotlight. Shame you have to go. Here's my friend Peter handing out a flyer for the Dreams on Wheels exhibition to a father and daughter. 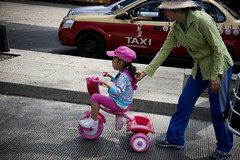 And, on the right, a dad on a Kickbike giving his daughter a push. The street is closed to traffic but there are a couple of massive roundabouts where we had to stop for cross traffic. 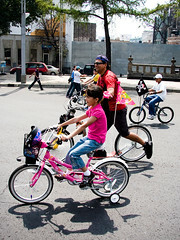 I'm guessing we had a stretch of about 4 km to ride on, not including the traffic calmed old town up near Zocalo. 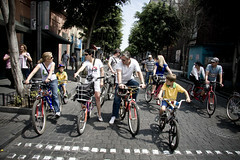 Eight lanes of take-it-easy and enjoy-the-ride goodness in the splendid Mexican sun. Far from any destructive and virtually pornographic obsession with safety. 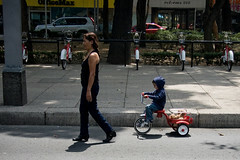 I loved seeing the great numbers of kids on trikes or bikes with training wheels out with their mums and dads. Bicycle-wise, there was the wildest collection of bikes to be seen. Old cruisers, chunky mountain bikes, Chinese workhorse bikes, you name it. And, like above, an astonishing number of retro-chopper bikes, like right out of my childhood. Unbelievable. And the ever-present I Bike CPH t-shirt. 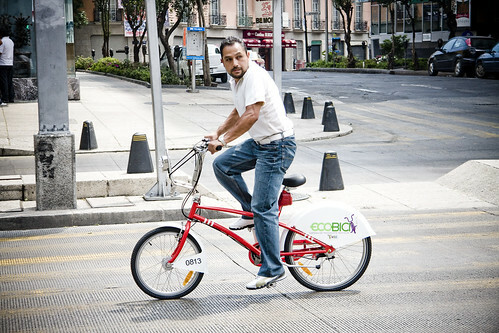 And the occasional new bike from Mexico City's recently launched Ecobici bike share programme. Ah. The simple joy of going for a bike ride.